For a photographer, our world is an astonishingly large place. From the smallest insect to the greatest mountain, just about everything on our planet can produce a great photograph. Many are able to narrow things down by choosing a specific discipline - only photographing small insects of towering mountains, for instance. Another way for a traveling photographer to focus in on specifics, however, is to design a bucket list of things to shoot. Now, the specific content of such a list should depend upon each photographer’s specific interests, not to mention what’s possible from a travel perspective. To give a general idea of what such a list might look like though, here is my own (incomplete) travel photography bucket list. Better known as Bolivia’s “salt flats,” Salar de Uyuni is a stretch of land where seasonal rainwater creates a flat, smooth layer that perfectly reflects the sky and looks like something from out of this world. Spanning over 10.5 kilometers, it’s a massive area that can absolutely take your breath away, and it makes for some of the most unique photography opportunities in the world, provided clear conditions. The famous canals make Venice one of the most picturesque cities on Earth, and have always inspired artists, from painters to photographers. Some might argue for getting up at dawn and capturing the canals when they’re still, and the city is quiet. However, there’s also an art to capturing the canals in motion as gondolas move to and fro and locals and tourists alike enjoy the surrounding beauty. Aurora Borealis, or the northern lights, can be seen from many places in the world, so I won’t point to a specific destination. Northern Scandinavia, broadly, is a great vantage point however, and given that the lights are always different, it doesn’t much matter what specific spot you choose. Suffice it to say you’ll be attempting to capture one of the most remarkable natural phenomena on our planet. With its coastal areas full of white beaches, gorgeous water and unique rounded mountains, Southeast Asia would be a shame not to include on a list like this one. I’ve gone with Palawan because despite being one of the more popular island areas, it remains one of the most striking. Accessibility doesn’t hurt either. ﻿If you’re interested in photographing nature in action rather than just beautiful places, herding animals can always make for excellent subject matter. And the regular migrations of the zebra herds in Botswana are about as impressive as it gets. Personally, I almost think I’d be too transfixed by this site to get my own photographs! ﻿This may not be a surprise, but it’s one of the world’s top landmarks for a reason. 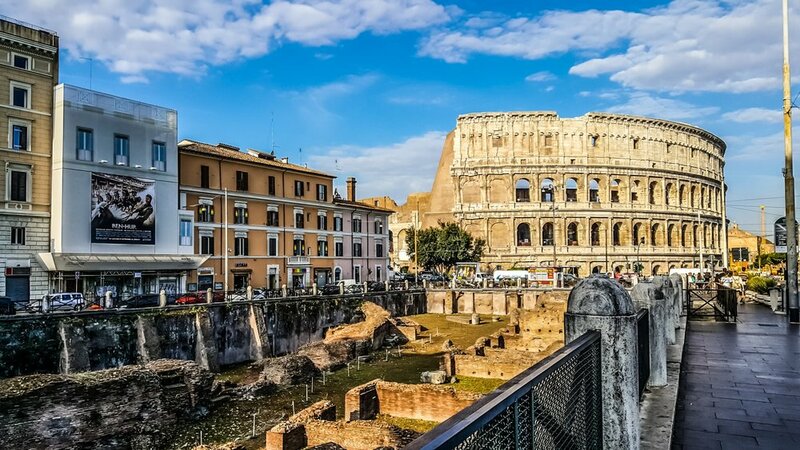 Actually, the Colosseum looks as good as it does today thanks to sustained restoration and maintenance efforts, including lottery funding and a 25 million euro donation from a fashion mogul. Whatever they’re doing, it’s working, because this is still an absolutely stunning visual monument to the ancient world, and one that can be photographed with the city around it. ﻿I’ll counter the Colosseum with something a little less expected. The Ashikaga Flower Park in Japan is essentially a large cluster of wisteria trees that bloom together in the spring and make for a breathtaking display. Somewhat ironically Japan’s spring season is actually famous for cherry blossoms - but for my money, this is an even more special sight. ﻿I’m trying not to include much in the way of entire areas or cities on this list, but there’s no escaping the allure of Paris as a visual. I dream of being able to shoot the city from a rooftop vantage point on a clear, sunny morning, and perhaps again at dusk (with a glass of wine in hand of course). ﻿Stonehenge itself can actually look rather bland, despite its historical significance. However, its mystique still attracts plenty of attention (apparently there’s going to be a concert there soon, for the first time), and if you’ve ever seen it photographed with the sun low in the sky such that it shows through the boulders, you’ll get why it might be a target spot for a photographer. ﻿Here again I’m not exactly going out on a limb. We all know exactly what the pyramids look like because we’ve seen them photographed, drawn, painted, and animated our whole lives. But something tells me the chance to interact with them in person would make any photographer’s year. ﻿If you look into the matter you’ll find that the southwestern United States is actually full of national parks and canyons, and some of them are less cliché, so to speak, than the Grand Canyon. Bryce and Zion, for instance, are sensational natural wonders. But the Grand Canyon is iconic for a reason, and the way the sun plays with the rock formations means every photograph is entirely different. ﻿Essentially a wild expanse akin to but not synonymous with the Amazon rainforest, the Pantanal has been called Brazil’s best kept secret by none other than National Geographic. While it’s a lush and beautiful area in and of itself, it’s also known to be an exciting place to capture images of wildlife - such as wild jaguars perched aloft in trees! I can’t imagine a much more thrilling photography opportunity. ﻿It’s hard to narrow down places to photograph in Australia, so I’m going a little bit outside the box with this one. Lake McKenzie is located in Great Sandy National Park, on Fraser Island. The sand surrounding the lake is pure white, and the water is so clean and pure it doesn’t support life. Sign me up. Castles all across Europe make for wonderful photography opportunities. But Neuschwanstein is truly so special it will make you believe you’re living in the middle of a fairy tale and no one’s bothered to tell you yet.